The Treasurer Satellite - West Lawrence Office building houses some personnel from the Treasurer's Office. This satellite office (inside the Dillons at 6th and Lawrence Avenue) is open Tuesday - Friday from 7:00 a.m. to 6:00 p.m.
Continue on 6th Street for approx. 1.3 miles until you reach Lawrence Avenue, then turn right (North) onto Lawrence Avenue. Dillons will be on your right at Lawrence Avenue and 6th Street, and the Treasurer's West Satellite Office is located inside of Dillons. 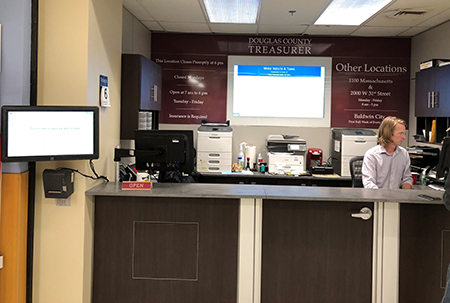 The Treasurer Satellite - West Office is located at 3000 West 6th Street (Dillons) in Lawrence, Kansas. Take K-10 West towards Lawrence. Take the 23rd Street exit. Continue West on 23rd Street until you reach Iowa Street, then turn right (North) onto Iowa Street. Continue on Iowa Street for 1.3 miles until you reach 6th Street, then turn left (West) onto 6th Street. Continue on 6th Street until you reach Lawrence Avenue, then turn right (North) onto Lawrence Avenue.